This new edition of Newman's Birds by Colour has been updated to reflect latest name changes and now includes distribution maps for each species. It offers a quick and easy way to identify birds: they are grouped according to the dominant colour of their plumage (or even beak or legs) and other distinctive and clearly visible features such as collar and breast bands, head crests and speckled plumage. 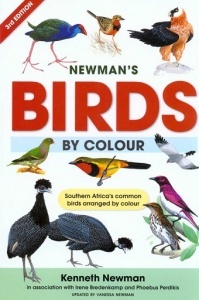 The colour-coded arrangement makes the book an ideal guide for the beginner birder, but will also appeal to more experienced birdwatchers as a quick reference to common species. A comprehensive introduction to the world of birds and birding includes such topics as bird classification, identification features, migration, feeding and habitats. There are helpful sections offering information on what you need to go birding, and where and when to look for birds.